‘So he said to the man who took care of the vineyard, ‘For three years now I’ve been coming to look for fruit on this fig tree and haven’t found any. Cut it down! Why should it use up the soil?’ (Luke 13:7). In modern day gardening we can find ourselves constantly running to the store for more ingredients for our garden and landscapes. Some of the more expensive ingredients for our garden are soil and fertilizer. But what if you could just grow your own fertilizer that also continually improves your soil? Some of you may already compost your kitchen scraps, weeds, and leaves to make plant food, but how about growing something that can go right into your garden. And, afterwards it grew back quickly so that next month you had more? The best fertilizer is one that gives the plant only what it needs and doesn’t destroy the soil. Some fertilizers will destroy the balance causing a need for continued fertilization just to keep your plants happy. Now you can stop reading about fertilizer numbers and throw away that fertilizer spreader for good! The Comfrey plant is not only a great fertilizer and soil builder, but it has many other uses on the homestead. Have a purpose in mind when you plant comfrey. It will spread, but that can be a good thing. Know its benefits in advance and make a plan to use it. 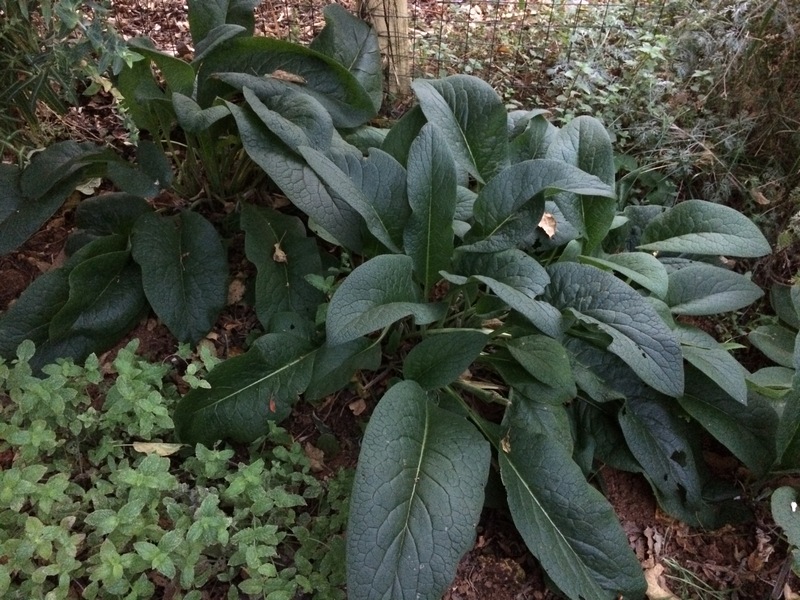 Comfrey is a perennial, but will die back during the winter in the colder climates. I find that it does well in the sun or partial shade, like under an apple tree. It will also do well in an open field with very little water once it’s established. Comfrey plants can grow up to about 3’ tall and wide. The leaves are large and the branches will splay out as it gets taller. It will also begin to sprout new plants with each season. As it spreads, you can pull up the smallest of new sprouts and replant them just about anywhere. It transplants very well. Comfrey has a large beautiful purple flower that will attract bumble bees so you may want to keep it a distance from your outdoor dining area. My neighbor’s honey bees come over and visit my comfrey (and lavender) and their honey is exceptional! It’s also somewhat deer resistant. They may nibble, but it always grows back quickly. As the plant gets larger the leaves will have slight prickly fuzz that animals don’t tend to like. If you are good at starting seeds, then use a good quality seed and that may be the least costly method. Or, you may have a neighbor willing to give you a piece of the root of one of their plants. Comfrey can, and should, be split and transplanted. If you would like a root cutting, please email us (further information below). There isn’t much you need to do to the soil, unless it’s very rocky or sandy, then add some amendments, but only if you really need it. Comfrey seems to be easy to start just about anywhere, but may grow quicker in a balanced soil. Keep the soil moist and that should be all it takes. Once the plants are about 12-18” tall, cut the leaves off with a sickle or hedge shears and place them directly on the ground. This is the ‘chop-and-drop method’. For a layer of mulch, place the whole leaf down creating a layer about 1/2” thick of complete covering. While acting as mulch, the leaves will also begin to break down adding nutrients to the soil. Or try grabbing a hand-full of leaves, tearing them into pieces, and placing them around your vegetables. Once those leaves have decomposed, grab a few more and do the same. You can’t over-fertilize with comfrey. The leaves can also be chopped up and turned into the soil with a spading fork before placing plants in the ground. Don’t hesitate to add comfrey leaves to your soil when planting new seedlings either. They will appreciate the extra boost. Comfrey is a very resilient plant and will continue to grow back after each cutting. 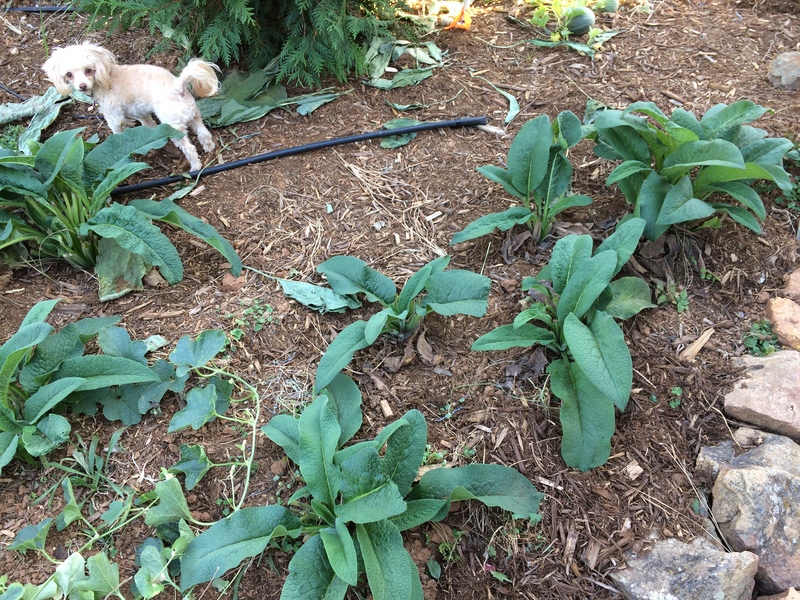 In the photo below you will see a patch of comfrey that is coming back in only two weeks after being cut down completely (that’s a 5-pound poodle, to get some perspective). Comfrey is a dynamic accumulator, which means that it will draw the nutrients into the plant making it more available to use. The soil will improve just from having the plant growing in that area. Place the plant around your fruit trees or garden as a companion plant. Then you can easily chop and drop on occasion, and you will have a continual source of nutrients. 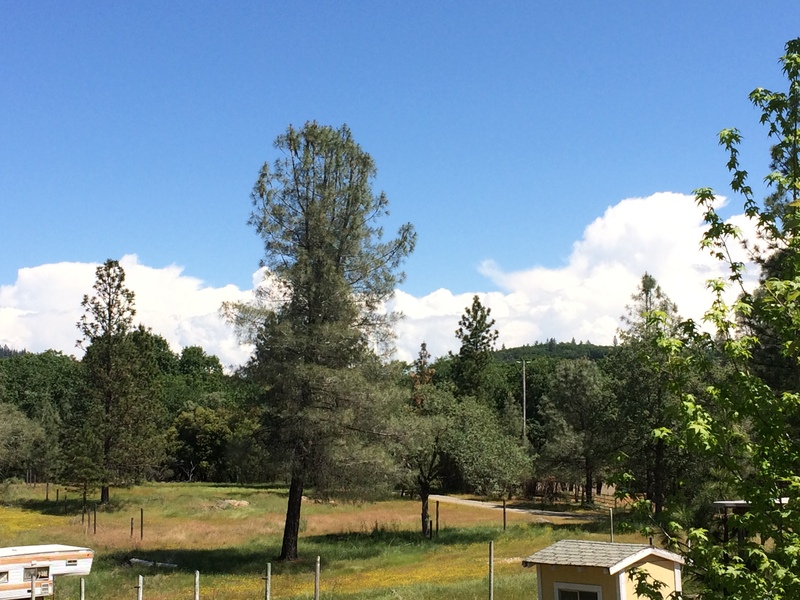 I keep a few plants in each orchard as well as each area of the garden. Comfrey can also be added to your compost pile to encourage the decomposition. Use a small amount at a time or you may find that sludge will build up in your pile. You can also make comfrey compost tea by soaking the leaves in water for about 4 weeks. It doesn’t smell good so be prepared. I personally prefer worm casting tea, but this is an option if you’re looking for additional nitrogen. Comfrey is also a great rejuvenator for old grassland. Plant a few small root cuttings around a field and you will be replacing the grass with something potentially more useful. If you have goats, then you know they are less picky, and it may be best to keep them away from comfrey altogether. Comfrey can be poisonous to the liver. There are some that use comfrey internally, but it’s not suggested unless you are very familiar with the quantities required. Do your research thoroughly with this one. Although it contains poisonous pyrrolizidine alkaloids, it has many topical uses and can be used internally in small quantities. Comfrey contains allantoin, a substance known to aid granulation and cell formation which is what the healing process is all about. It’s well known for its ability to heal bones and soft tissue. I’ve pureed some in a blender with water, made patties out of it, froze them and then wrapped them in gauze and placed it on a strained elbow. I felt recovery within a few days so who knows how long the healing may have taken otherwise. It can also be used for healing the skin. I would not suggest if for sensitive skin, such as eczema, as it can be irritating, but small cuts and bruises will benefit from the absorption of the chemicals in comfrey. 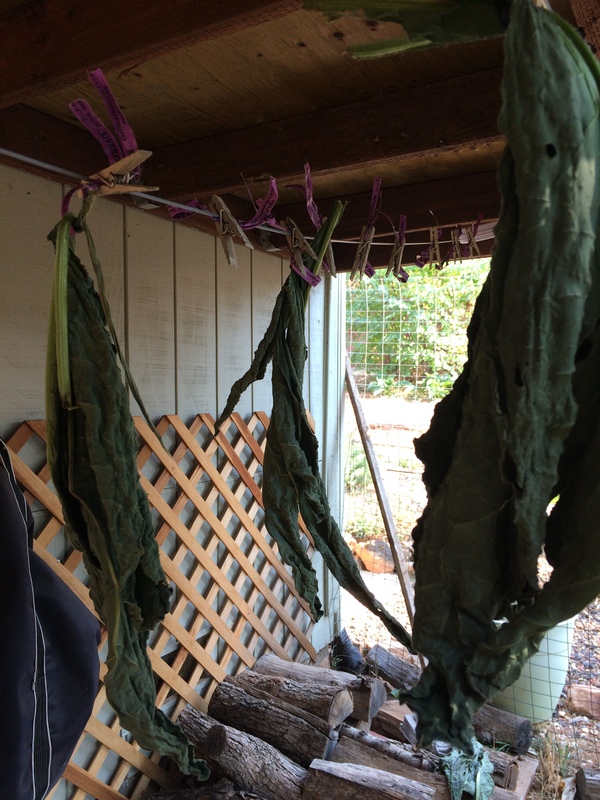 Comfrey is best used fresh, but if you need to store it, dried comfrey can also be useful. When planning your homestead or doing your vegetable garden design, be sure to work in a few comfrey plants for sustainability and abundance! ‘’Sir,’ the man replied, ‘leave it alone for one more year, and I’ll dig around it and fertilize it.’ (Luke 13:8). Next Green landscapes, green lawns, and thriving gardens. ‘Nitrogen Fixing’ Why do I want it on my homestead?